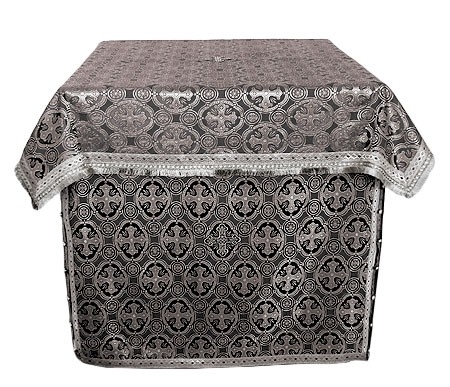 Orthodox Church liturgical Oblation table vestments (black-silver) by Istok Church Supplies Corp.
Are you looking for a black-silver Oblation Table vestment that matches your Church’s Holy Table vestment? You’ll find it in our collection of made-to-order black-silver Oblation Table vestments. Along with an assurance of high quality vestments, customers can also count on Istok Church Supplies for reasonable prices and superior customer service. The Oblation Table has an important role during the Divine Liturgy church service. It is the sacred place where the bread and wine are prepared. Traditionally, the Oblation Table is decorated in the same color cloth as the one used for the Holy Table. So if you’ve picked a black-silver Holy Table vestment, it makes sense to purchase a black-silver Oblation Table vestment. Our black-silver Oblation Table vestments are made from lavish ecclesiastical church fabrics. Depending on the type and category of fabric being used, prices of these vestments can vary from around four hundred to one thousand seven hundred US dollars. No matter what your budget is, you are sure to find a suitable vestment. We provide standard decoration for these vestments at no extra cost and customers have the option to select premium decoration and velvet inserts for an additional cost. The prices shown are for Oblation Table vestments of specific sizes. We are happy to accept custom, made-to-measure orders from our esteemed customers. All that customers need to do is provide us the exact measurements of their Oblation Table by making a note in the Notes section during check-out. Our experienced and skilled tailors in Europe execute each order by hand and pay meticulous attention to the tiniest of details to ensure an expertly crafted Oblation Table vestment worthy of use in an Orthodox Christian church. We ship worldwide via land and air, so order your very own black-silver Oblation Table vestment from your corner of the globe! You are great people and great Service. God Bless you all!